There are many twists and turns to the pronunciation history of a very old language like Latin. The pronunciation of the ancient Romans, called the classical pronunciation, was modified by Christians in the Middle Ages, when Latin became the language of the church and of the educated class. You may see this pronunciation referred to by a number of names: ecclesiastical, medieval, Church, Christian, or Italian. This pronunciation is still used today in the Catholic Church, though very little since Vatican II, and in music schools for choral classical music, where it is slightly modified for the demands of open vowels in singing. After the rise of modern languages, and the decline of Latin as a universal language, each nation’s schools tended to speak Latin in their own native accents. In addition, after the Reformation, the British developed their own system which was slightly different from that spoken on the continent. To further confuse matters, 19th century scholars researched the pronunciation of the ancient Romans and introduced the restored(classical) pronunciation into English and American schools. Ignoring all of these minor variations, however, the two main pronunciation systems for Latin are classical (restored) and Christian. They are very similar. Christian Latin is closer to modern languages, is used in classical music and Christian prayers, and sounds more beautiful to modern ears. In my opinion, the confusion and damage of the forced introduction of the restored classical pronunciation system into English and American schools at the turn of the century was a significant factor in the decline of Latin in the school curriculum. Even today, the decision over which pronunciation to choose is an obstacle to the restoration of Latin in the curriculum of Christian and classical schools. In practice, both in England and on the continent, the difference between long and short vowels has been ignored, all of them being given the quality of long vowels. The same is true to a lesser extent in America, where the difficulty of learning Latin in our lax culture makes the burden of trying to master very specific vowel sounds, for which English speakers do not have a good ear, an unrealistic goal. Most Latin teachers, in reality, have quite enough to do to teach Latin grammar and have, out of necessity, focused very little on the nuances of pronunciation. In reality, then, the only real differences between classical and Christian pronunciation that real students are likely to encounter are the letters v, c and g, and the diphthong ae. Not a big difference. Latin was and is a universal language. National languages do not have a standard pronunciation, a universal language even less so! English is now a universal language, and each nation speaks it with its own native accent. The desire to master a pronunciation of Latin that is foreign to one’s native tongue is unnatural and a misplaced effort in the challenging task of learning Latin. There are many benefits to Latin study, but lowest on the list surely is the ability to speak it in some idealized pure form that few scholars have ever attained because someday you want to read the Aeneid exactly as the Romans did. A fastidious concern about pronunciation is an impediment to learning a language. Those who will plunge in and speak a modern language learn much more quickly than those who are self-conscious about pronunciation. How much more so for a language that is learned through the grammar-translation method rather than the conversation method. The pronunciation guide in the Memoria Press Forms Series is simplified for beginners so that pronunciation will not become an impediment to learning Latin grammar and vocabulary. As students progress in Latin, pronunciation tips are added in a natural, incremental way. 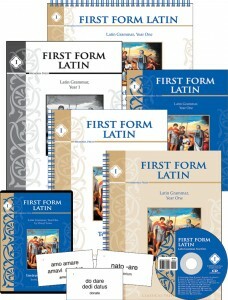 The pronunciation system recommended is Christian, but Memoria Press Latin programs can just as easily be used with the classical pronunciation. The difference between long and short vowels is not emphasized, and long vowels are unmarked in the text, except to occasionally distinguish similar forms. For beginners, the most important question is which syllable to accent. In Latin there are only two choices, the penult (next to last) syllable, or the antepenult (second to last) syllable. In First Form, you accent the next-to-last syllable unless the second-to-last is marked. Simple! Pronunciation tips are included in the Memoria Press Forms Series. Originally published in The Classical Teacher Spring 2013 edition.